Chervil is a wonderful addition to a wide variety of foods, including pesto and salads, and dishes featuring asparagus, beets, potatoes, eggs, and oysters. 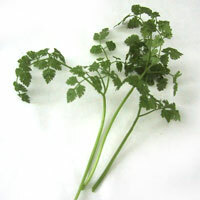 It can be used like parsley, but keep in mind that its delicate flavor is diminished by heat. Wait until the last minute to add it when using chervil in cooked dishes. Chervil marries well with other herbs, especially tarragon, chives, and parsley. It is not an overpowering herb, so it can be used generously. In fact, its subtlety enhances and improves the combination of other herbal flavors. The information presented in the Food Guide is for informational purposes only and was created by a team of US–registered dietitians and food experts. Consult your doctor, practitioner, and/or pharmacist for any health problem and before using any supplements, making dietary changes, or before making any changes in prescribed medications. Information expires December 2019.